New England Patriots quarterback Tom Brady has been suspended for four games by the National Football League after an inquiry into under-inflated balls. 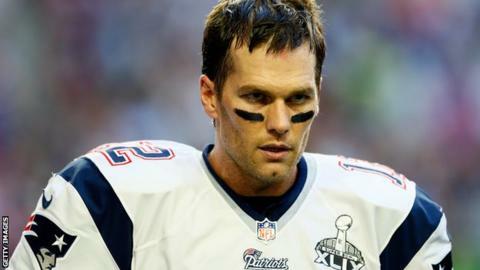 Brady, 37, will not receive any pay during his ban, while the team were fined $1m (£642,000) for a scandal that has become known as 'Deflate-gate'. The NFL said on Monday the club were sanctioned after "failure to cooperate in the subsequent investigation". Last week, Brady said the findings did not taint his side's Super Bowl win. The NFL investigated claims the Patriots had deflated match balls to give themselves an advantage in January's 45-7 play-off victory over Indianapolis Colts in Boston, which sent them to the Super Bowl. According to reports, 11 of the 12 game balls they provided for the rain-affected match were under-inflated by about two pounds per square inch, giving Brady more grip in the cold and wet conditions. Brady was "at least generally aware of inappropriate activities", according to the independent Wells Report. He is considered to be one of the greatest quarterbacks of all time, winning the Super Bowl Most Valuable Player award three times. As well as their fine, the Patriots will forfeit a 2016 first-round draft pick after "violating the NFL policy on the integrity of the game". Dressing room attendant Jim McNally and equipment assistant John Jastremski have also been indefinitely suspended without pay by the club.